If you’re wondering whether to get the Insta360 One X (reviewed here) or the GoPro Fusion (reviewed here), then look no further. 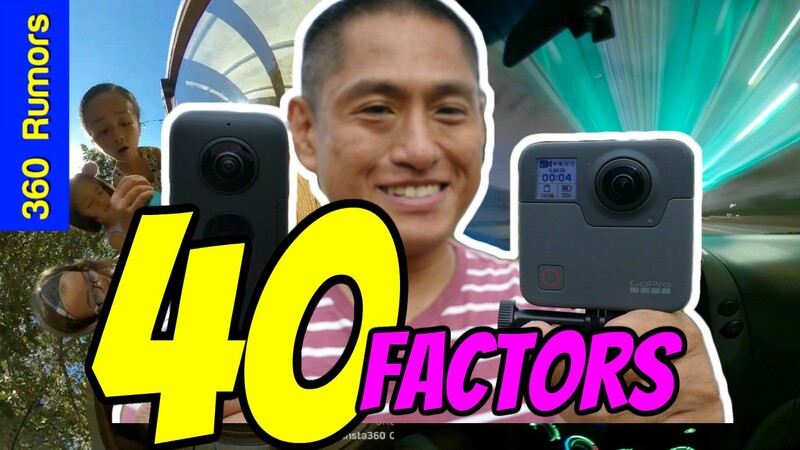 This is the ABSOLUTELY MOST detailed comparison between the Insta360 One X and GoPro Fusion, with 40 factors tested and compared! Love your website and comprehensive reports of 360 cams! Wished I would have stumbled on this earlier. Would have saved a lot of times. Passed on your info to others. I am still waiting out to buy the 1X this Black Friday. Saw the Rylo updates and your report but no one has made a detailed findings based on real life experience yet. Have you seen this YT trashing on the 1X by this guy. Seems that he doesn’t have all the info as your reports. Really appreciate all your help thus far! Hi Nomad24! I’m sorry i didn’t see your comment until now! As for that guy, i think he criticized the One X just in order to be controversial and to be noticed. Finally bought my Insta360 One X (thanks to all your good advice!) before Xmas. Took it to the cold part of Quebec City (-18degC and to over -30degC with wind) so my battery didn’t last more than 10min. Insta360 support said the original batteries are not made for those cold temps but coming out with ones that can go down to -4degF (or -20degC) and up to 86degF (or 30degC). At any rate, I used some velco strips and my self stick (attached to a tripod for extra height) to strap it down the 1X and a long micro-usb cable to my backpack water bottle insert. And inside my bag, I have a power bank. This last me all day without any worries battery runs out. Of course I am mindful that the recording is limited to 30min (as you’ve shared before) but thought I passed this along to you and your subcribers as it seems to be a problem for other users. Now you’re handsfree and look less conspicuous walking around holding on to a camera, especially in places where I had people come tell me they don’t want to be filmed. Now they don’t see it as it’s hanging on the backside of my backpack and is taunt to the bag so it doesn’t move around or tilt. Hope that is helpful and thanks so much for you support. I used your link so hope you got your credit. Thank you so much Dan! Sorry for the delayed comment! No worries Mic! We’re all busy. Btw, I found a better solution for the above chargin rig. It’s a Moza mini charging tripod. About 3000mA battery that can attach to the bottom of the InstaOne X selfie stick. Makes things a whole lot easier. Feiyu also has a similar charging stick. Thanks Dan. I tried a charging handle with 6000mah, but the amperage seems weak, so it charges very slowly. It’s much more practical to use a USB powerbank. Took it to the cold part of Quebec City (-18degC and to over -30degC with wind) so my battery didn’t last more than 10min. Insta360 support said the original batteries are not made for those cold temps but coming out with new ones that can go down to -4degF (or -20degC) and up to 86degF (or 30degC). At any rate, I used some velco strips and my self stick (attached to a tripod for extra height) to strap down the 1X (along with a long micro-usb cable) to my backpack water bottle insert. And inside my bag, I have a power bank. This DIY setup lasts all day without any worries of the battery running out. Note: I am mindful that the recording is limited to 30min (as you’ve shared before) but thought I passed this along to you and your subcribers as it seems to be a problem for other users. Now you’re handsfree and look less conspicuous walking around holding on to a selfie stick with the 1X, especially in places where I had people come tell me they don’t want to be filmed. Now they don’t see it as it’s hanging on the backside of my backpack and is taunt to the bag so it doesn’t move around or tilt. Hope that is helpful and thanks so much for all of your support. The 1X app for iPhones is easy to use but still learning. I used your link to buy the 1X so I hope you were able to get credit for it. I’ve watched your video on the 40 comparisons. Thank you. Seems like the Fusion won in many of the tests. If I’m only want a 360 camera for taking photos, which camera do you recommend for good quality 360 photos? I’m an average consumer who know nuts about photo editing or color adjustments.